Akai has announced the addition of VIP 2.0 software with the Creative FX Plus suite to their family of Advance keyboards. 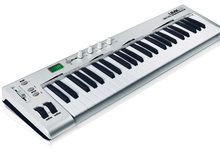 At the NAMM, M-Audio has announced the introduction of their new controller, the CTRL 49. ROLI introduces the Seaboard RISE 49, a four­-octave model of its Seaboard Rise controller. Native Instruments today announced a special deal with reduced prices on three of their Komplete Kontrol S-Series keyboards. Nektar Technology partnered with Bitwig to offer their customers a brand new light version of the Bitwig DAW. Imagine a MIDI-controller keyboard that lets you seamlessly switch between virtual instruments from different manufacturers, keeps all your patches together in a single browser, and automatically maps controller information to its knobs and switches. Native Instruments has launched a deal for Komplete users who haven’t purchased their Kontrol S keyboard yet. Nektar introduces at Musikmesse version 1.5 of the integration system for Cubase for its Panorama MIDI controller keyboards. Novation decided to enhance the design of its Launchkey MIDI controller keyboards and pads as well as the Launchpad Mini.